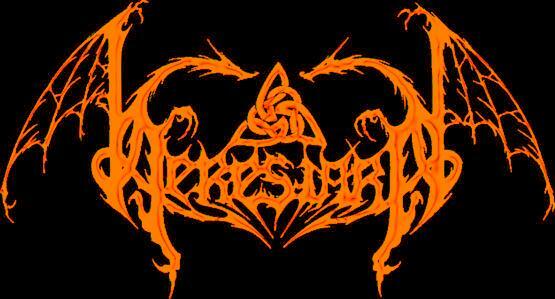 Having heard their demo, "Dragons of War", I wasn't sure what to expect of Heresiarh's debut, "Mythical Beasts and Mediaeval Warfare". The demo sounded very rough with a production bordering on the coarse; also, there was a lot of emphasis on grunted male vocals that somehow I didn't like too much. Heresiarh play what they called 'Dragon Metal', which basically means that their lyrics revolve around dragons and elves. The lyrics are backed by a very interested amalgamate of the intensity of black metal, the heaviness of death metal and the slight mediaeval touch of folk. I heard background guitar textures like those in Sear Bliss, keyboard carpets not unlike those in Ordo Draconis, lead guitar embellishments like those in old Nightfall, and general folk influences previously heard primarily in Skyclad (or perhaps In Extremo). Somehow, the word 'Arcturus' springs to mind as well. Before you draw the wrong conclusions, however, let me emphasize that the band may have distinguishable characteristics like those in other bands, the musical result as a whole is both original and satisfying. Especially the ever-present diamond-like voice of the Elven Lady Rasa succeeds in captivating, enchanting, almost bewitching your sonic organs. By contrast, Morgueldar Dragonseye eardrum-rending screams have the power to haunt you into your deepest, darkest, dragon-ridden nightmares. This is really good stuff, a great new band that has succeeded in breathing fresh (well, freshly dragon-fouled :-) air through the halls of deathly black (or blackened death) metal. Although perhaps the production could have been a bit more balanced and crisp - which might be due to the fact that I reviewed an advance tape - this album is the year 2000's obligatory new thing to check out!